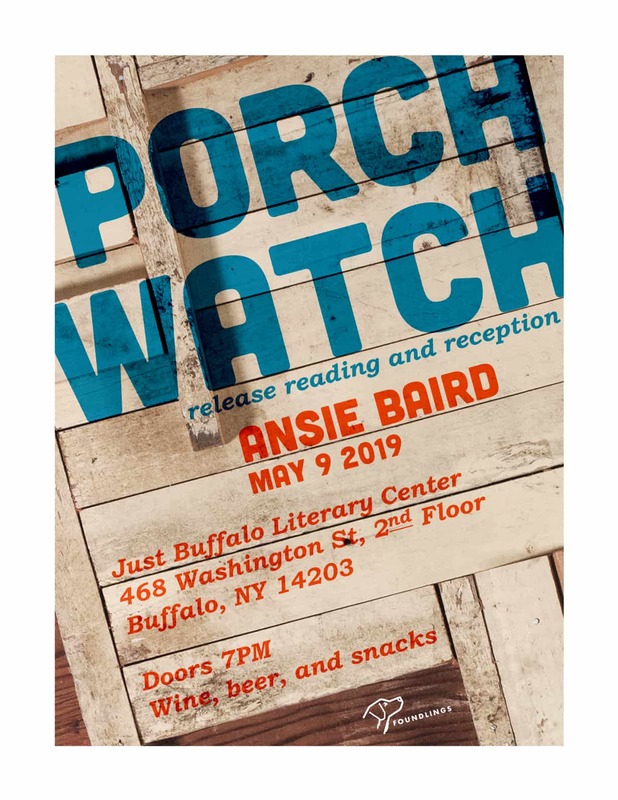 Ansie Baird will read from her latest chapbook, Porch Watch (Foundlings Press). The reception starts at 7pm. Beer, wine, and snacks will be provided, and copies of the book will be on sale. Ansie Baird received her M.A. in English from SUNY Buffalo in 1979. She taught for forty years at The Buffalo Seminary, is a former editor of Audit Magazine and Earth’s Daughters, has taught for Just Buffalo in their Writers in Education program for many years (a participant in Poetry in the Schools). Her work has been published in The Paris Review, The Southern Review, Poetry Northwest, and numerous other journals. Her book, In Advance Of All Parting, won the White Pine Press national poetry competition and was published by White Pine Press in 2009. In May 2016 she was one of four poets included in a book entitled Four Buffalo Poets published by Outriders Press. In September 2016, her second full-length collection of poems, The Solace of Islands, was published by BlazeVOX Press. Ansie Baird’s new book is a lovely mix of wit, emotional range, and craft–a craft that responds to each of its poetic occasion in a voice that has been tutored through her earlier collections to be sharp, humorous, intelligent, able to be at once acerbic and honestly emotional. Porch Watch–with its implication of constant vigil–is full of warm appreciations of friends, of elegies that compose the broken heart into a right ritual of mourning: into, indeed, a style of blessing, each one scattered where she wants all her friends ashes to be scattered “in the fields of praise.” I love the jaunty fortitude of these poems, each one demonstrating (without a trace of self pity or self indulgence) how a rendered life, shadows and all, can be taken on, fully engaged with. “True things,” she says, “make up the miracles of your life.” Her poems are just such big-hearted, open-eyed true things. Ansie Baird’s easy intimacy opens the doors of these poems and invites us into her confidence. Porch Watch looks at a life, or maybe a collection of lives — the wheres and hows and might-have-beens of memory. In a style that shimmers off the page, Baird writes of loss, living, hosting, and having. These poems are nothing short of spectacular.